For older singles who want a serious dating site with a scientific compatibility test, perfectmatch.com will help them find a perfect match. If you are an older single, who has never been married or is widowed or divorced and looking for a perfect match, then you may just find one at Perfectmatch.com. It is an online dating site that caters to the 50-plus crowd. However there are members of all ages. Canadian and U.S. singles (single, widowed or divorced) are welcome at PerfectMatch as long as they are above the age of majority in their area. Heterosexual, gay and lesbian singles looking for a dating or long term relationship are also welcome. There are many different points of entry as well depending on what you’re looking for. If you want to meet mature, intelligent potential partners in an easy, affordable way from the comfort of your home, perfectmatch dating fits the bill. Just about every perfectmatch review is given a four-star rating or higher. Signing up for a PerfectMatch.com membership takes about 15-30 minutes. That not as long as the hour or more to answer eHarmony’s 400 questions. Dr. Pepper Schwartz, a professor of Sociology at the University of Washington is a graduate of Yale University, where she earned an M.A. and Ph.D in Sociology. She is the author of 15 books, including Finding Your Perfect Match and The Love Test. If you want to communicate with compatible matches, you have to be a paying member. Premium memberships offer all of the free membership benefits, plus unlimited searching, higher search rankings, the ability to add eight photos, email with other singles, guaranteed matches and access to Dr. Schwartz’s column. Premium membership costs $5.99 for a five day trial, $59.95 for one month, two months for $79.95 ($39.90 a month) or three months for $110.85 ($36.95 a month). Platinum members receive all the features of Premium members, as well as top rankings in search, a highlighted profile, and the ability to have all users contact them, regardless of the other person’s membership status or compatibility, unlike eHarmony where members must accept or deny matches based on the compatibility scores. Platinum membership costs $139.95 for four months ($34.99 a month) or $199.95 for six months ($33.33 a month). Renewal rates for all memberships are lower than the initial rate, with most at $29.95 a month save the six month subscription, which is billed at $24.95 a month, which is a great deal, considering what you get. Note that all PerfectMatch.com memberships auto-renew, meaning you’re charged again at the end of the term if you don’t go in and change it. One disadvantage about perfectmatch.com is its small pool of members. Unless you live in a large city, most matches will be far away. Also, there is no chat program available. PerfectMatch.com guarantees a certain number of matches. Paid members who subscribe for two months and who don’t receive a minimum of four matches, don’t have to pay to renew their membership until they do. Purchase of the three or four month membership offers the same benefit but with six matches, and six months paid membership gets eight matches total, guaranteed. - The greatest advantage of PerfectMatch.com is that it attempts to match people who actually have chemistry. Additionally, it’s nice that PerfectMatch does not just try to match you with people who are exactly like you. The personality questions are designed to also help you meet others who complement your personality type. - You can see potential matches without paying for a membership, and every once in a while PerfectMatch.com offers free communication weekends. During these times, you can contact your matches without upgrading to a premium membership. 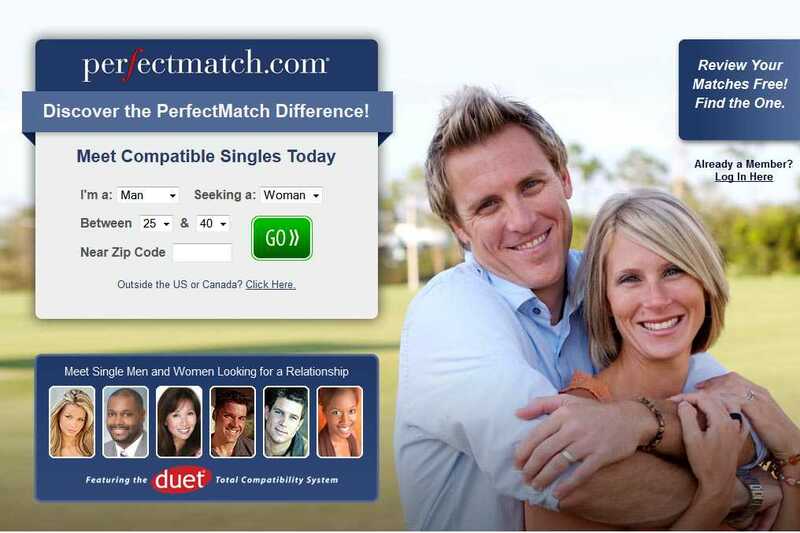 - PerfectMatch.com attracts serious users. With a compatibility profile like the eHarmony compatibility system, this site sets itself up as one of the more serious dating sites, intended for members who are really searching for a relationship. The high price, also, weeds out those who aren’t looking very seriously for a relationship. - For those who find online dating awkward and intimidating, particularly newly widowed or divorced singles who’ve been out of circulation for a while, PerfectMatch.com includes dating articles, dating tips, and an advice column written by the site’s founder, Dr. Pepper Schwartz. This Perfectmatch.com Review has pointed out many cool features like Duet Compatibility Test that matches couples based on several compatibility factors, an easy user interface, guaranteed number of matches, and the possibility of finding matches without having to pay. Perfectmatch.com’s proven track record is one reason why it’s one of the most popular online dating sites on the Internet. While it may be expensive, you can be sure to find serious mature people who are looking for a lasting relationship. You can sign up for a free basic membership or a five-day trial Premiere membership for about a dollar a day. With a Premiere membership, you can email or chat with possible matches and maybe find your perfect match like thousands of other singles have already done who are now happily married thanks to perfectmatch.com.